The Barber quarter was first minted in 1892 and designed by Charles E. Barber. The obverse has a stoic image of Lady Liberty wearing a Phrygian cap, a laurel wreath and a banner with the word LIBERTY. The reverse design is reminiscent of the eagle on the Great Seal of the United States. There are thirteen stars above the eagle's head. UNITED STATES OF AMERICA and HALF DOLLAR surround the coin next to the rim. A beginning collector should take a look at a number of circulated coins in order to obtain the knowledge of what is acceptable wear on the coin and what is not. Many affordable examples exist in lower circulated grades (G-4 and VG-8) can be purchased for around ten dollars. 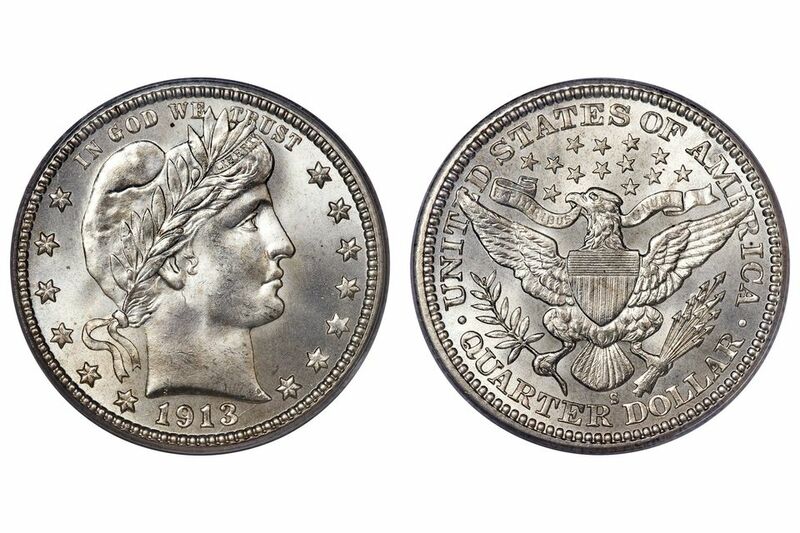 Intermediate coin collectors will consider assembling a date set of Barber quarters in circulated condition. This is a very affordable set especially for collectors on a limited budget. Look for circulated coins without any problems (scratches, nicks, dents, etc.). The advanced collector should strive for assembling a date and mint mark collection. Unfortunately, there are a few key coins that are expensive even in the lower circulated grades. If your coin collecting budget permits, you should strive to assemble an uncirculated set. The beginning coin collector on a limited budget will want to add a circulated specimen to their coin collection. You can purchase a higher end circulated coin (VF-20 or EF-40) for approximately $50.00. If you have a slightly larger coin collecting budget, you can purchase a low-end uncirculated coin (MS-60 or MS-62) for a little over $200. The intermediate coin collector striving to assemble a complete date set of Barber quarters will need to purchase a total of twenty-five coins. Average circulated coins should be closely inspected in order to avoid problem coins. A coin collecting budget of approximately $400 will allow you to achieve your goal. The advanced collector striving to purchase better quality coins will need a larger coin collecting budget in the range of $8,000-$9,000. For this money, the set will mostly consist of low-end uncirculated coins (MS-60 or MS-62). Only the most advanced coin collector will attempt to assemble a complete date and mintmark set of Barber quarters. This set will consist of a total of 74 coins. Additionally, your coin collecting budget will have to extend into the thousands of dollars. A circulated set will cost approximately $16,000. An uncirculated set will exceed $100,000. At these prices you should only purchase certified specimens encapsulated by a reputable third-party grading company. If you are looking for the ultimate challenge in collecting Barber quarters, the Philadelphia mint produced Proof specimens in almost every year. Average grade proof specimens (PF-63) will add about $25,000 to your collecting budget. There are no major varieties or popular mint errors in the series. Many factors go into determining the price and value of a coin. As a coin collector, you must develop your coin grading skills in order to determine an accurate value of your coins. Also, you will directly benefit by learning as much information as you can about the Barber Quarters coins. This includes such things as mintages, die varieties and detailed specifications.